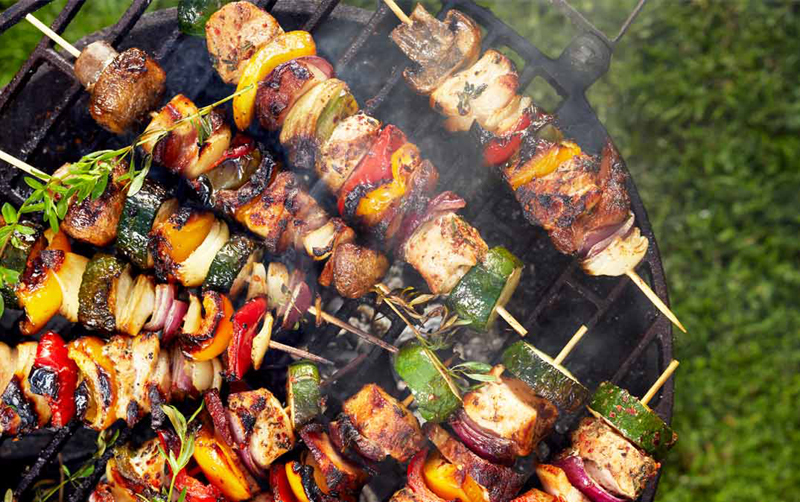 Summer is synonymous with cookouts, but often we don't choose the best foods for healthy grilling. “A beef patty without a bun can clock in at 230 calories and 15 grams of fat,” says Amy Keating, R.D., a dietitian at Consumer Reports. “And hot dogs and sausages can be high in saturated fat and sodium.” But don’t put out the fire just yet! With a few creative changes, summer barbecues can be delicious and nutritious. Marinate. Research shows this lowers HCA and PAH levels by up to 88 and 70 percent, respectively. Include herbs, like rosemary, Carpenter says. Their antioxidants help offset the effects of grilling. Brush the grill. Clean it every time you use it to reduce your exposure to chemicals from previous meals. Turn before it burns. HCAs are found in char; PAHs in smoke. “Turning meat often and cooking on indirect heat can prevent burning,” Carpenter says. Fire up one side of the grill, then cook on the other. The American Heart Association recommends eating seafood at least twice a week for its cardiovascular benefits. Intimidated about cooking it? Start with shrimp. “The shell helps keep the meat moist,” says Cedric Dagois, executive sous-chef of Four Seasons Resort Bora Bora. He suggests marinating medium-sized, shell-on shrimp in olive oil, garlic, and fresh herbs, then grilling for about 3 minutes on each side. Salmon is also easy to grill and is one of the top sources of heart-healthy omega-3s. Practically any vegetable can be grilled. Cook directly on the grates, or use skewers or a grill basket to prevent small pieces from falling through. You can grill veggie burgers, too: Amy’s California Light in Sodium topped CR’s tests. Prefer a “meatier” burger? Try Boca All American Flame Grilled.